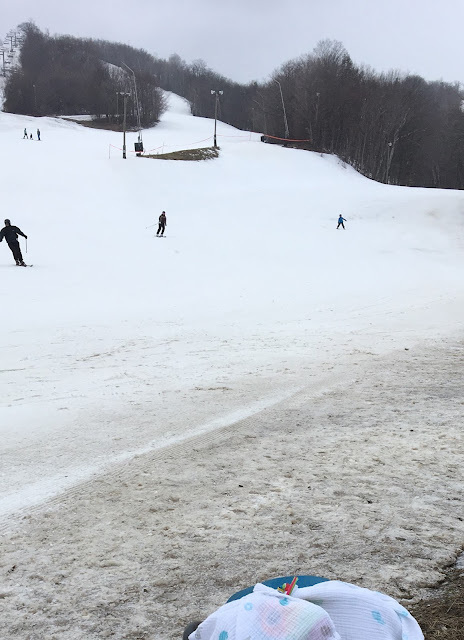 We capped off our March Break fun with a weekend trip to Blue Mountain for some skiing and other winter activities. We left early on Friday morning and arrived at the Village around 9:00. We got some skis for E and then he and Dave hit the slopes. It was a beautiful warm day, and although the snow got a little soft in the afternoon, they were happy to be out. E did some jumps in the terrain park and even with some wipeouts, had a great day! I walked around with Q. Winter/Spring views. We met for lunch at the pizza place in the Village. E looked at this maze and said, "it's so easy", and turns out, it was! They headed back up after lunch, stopping for a beavertail of course! After checking into our room, we changed into our bathing suits to enjoy the outdoor heated pool and the hot tub. The pool was warm, but once I got into the hot tub, I didn't want to go back to the pool. It was fun to have that as an option and E thought it was neat to swim outside during the winter. Then we donned our green shirts and went to the Irish Pub for supper. The music was a little loud, so we did our best to muffle Q's ears. Fortunately the band took a break shortly after we sat down. The next morning, it was my turn to ski with E. He's so excited he can't sit still! Here we come. Dave walked over to the bottom of the Orchard lift so he could see us and take a few photos. It was colder and wetter on Saturday so after lunch we just went back to our room for a few hours to rest. Then Dave took E back up for a few more runs. Q and I chilled by the fire pit and listened to the live band. We went back to our room and had some snacks and drinks. We decided to go for a small supper of poutine and frozen yoghurt, and a walk around the Village. It was a good call since we were all too tired to sit at a restaurant. I have never had Menchies before so I was a little overwhelmed with all of the toppings. I won't tell you how much mine cost, but I will tell you, I enjoyed every bite! On Sunday morning, we had breakfast and checked out of our room. We had no plans to ski because we wanted to check out the other activities. First up, the Ridge Runner Coaster. E went with Dave and then I went with him. It was much more fun than I thought it would be, and although the cost is a little high, I would recommend it. We had a slice of pizza for lunch and then it was off to the tubing hill. The cost is per hour and you have to pull your tube up the hill (and sometimes your child hops into their tube making it extra work), so it is a work out. I was way overdressed in my long puffy coat, but we had a good time. Dave even borrowed my tag to get a few runs in at the end. We were so happy we booked this little weekend getaway. We love visiting the Blue Mountain Village for the skiing and the atmosphere. As much as we love the lessons at Snow Valley, we were happy for the more challenging runs at Blue. E did great on the big hills.